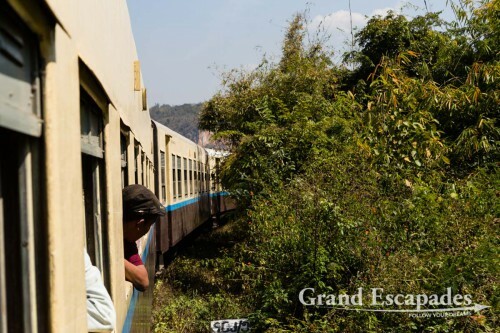 An epic journey to places we could hardly pronounce… It all started with a bizarre way of buying a train ticket in Pyin Oo Lwin and ended with hitch-hiking a ride on a truck into Hsipaw! 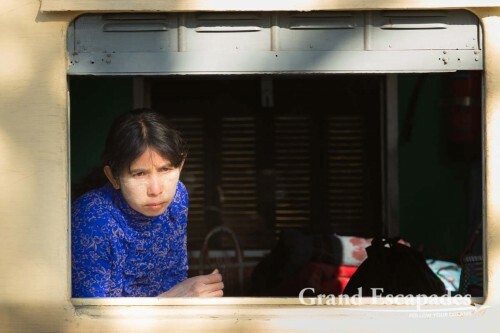 We wanted to do this properly and tried to buy the train tickets the day before leaving, but were told to arrive the day of departure at 07:30 am, for a train leaving at 08:22 am. The repeated “No problem” sounded confident. Well, only about 20 people were already ahead of us at the time told. After ten minutes, one (!) person left the ticket counter. After 40 minutes, everyone in the line was getting nervous and quietly praying for the train to arrive and hence leave with a significant delay. No chance! The train pulled in only 25 minutes beyond schedule… Almost like a Swiss clock! By then 10 tickets had been sold! And the line had gotten longer… The unprepared, extremely nervous travelers were kindly calmed by a guide, who was traveling with of a small group: “The train will wait until the last ticket has been sold and everyone has boarded the train,” he told the waiting crowd. 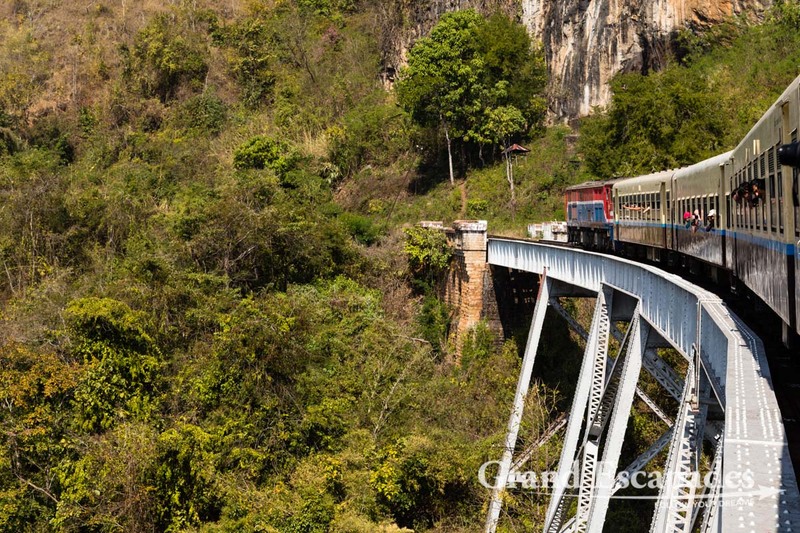 What makes this train ride so popular is the Gokteik Viaduct. 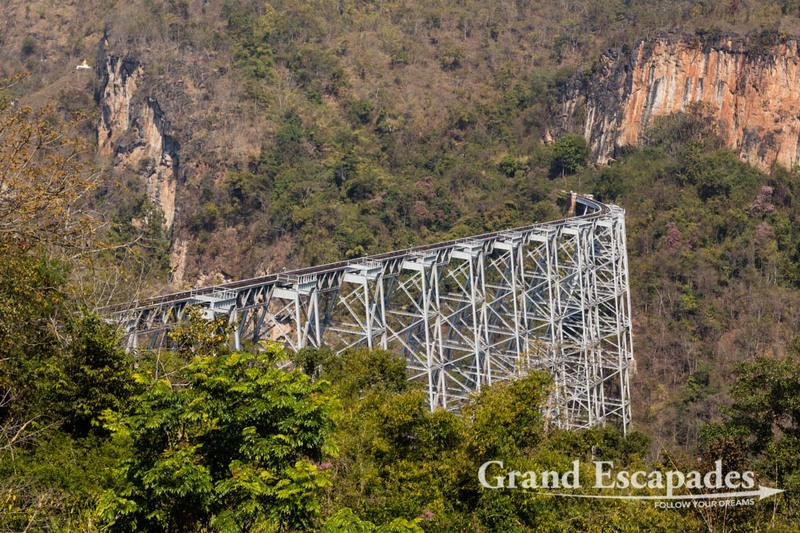 It is no longer a well-kept secret, even organized tours drive from Mandalay to Pyin Oo Lwin, board the train and then disembark shortly after the Gokteik Viaduct to either drive back to Mandalay by bus or continue towards Hsipaw for some hiking. Demand is now so high that extra carriages must be added in Pyin Oo Lwin, especially “superior class” ones to cater this new crowd, creating a bottleneck and thus delaying tickets sales and departure. 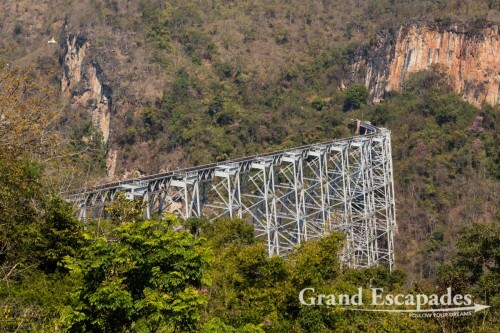 Finally Gokteik Viaduct. 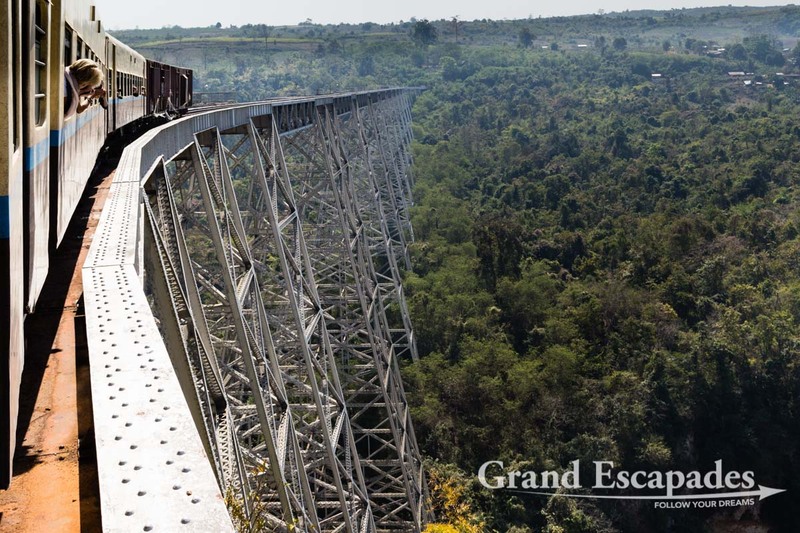 Built in 1901, it was then the world’s second highest train bridge at 318 feet. 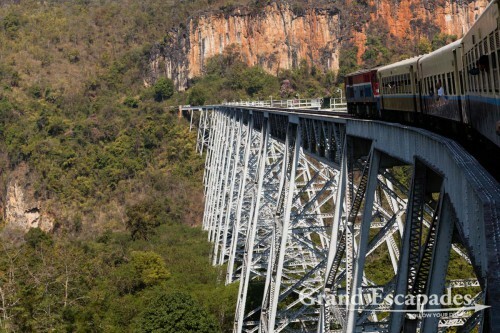 It still is the longest bridge in Myanmar with 2.257 feet. 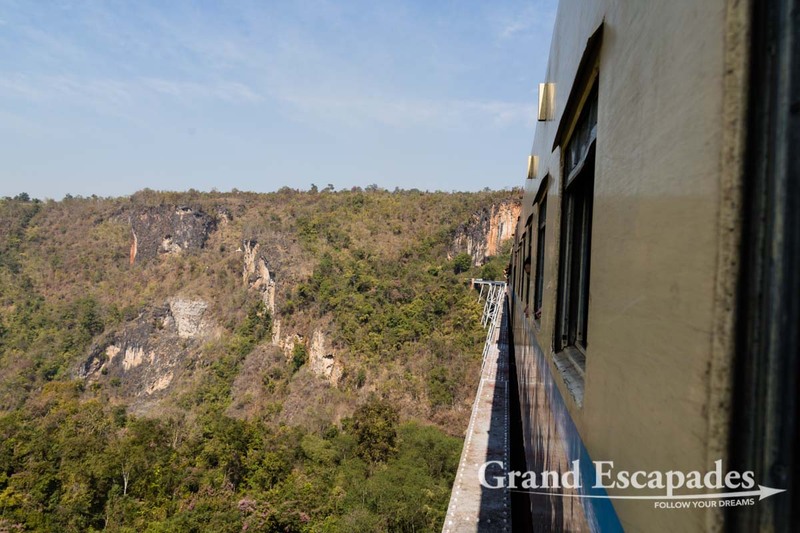 In order not to stress the vulnerable structure, we crossed at a crawling pace looking down, down … 100 meters into the precipice! It was forbidden, but somehow tolerated to take pictures of the bridge. Having become a tourist attraction, the train now stops a few hundred meters before the crossing. The busloads of tourists get a good picture of the bridge they are about to cross and have “15 minutes for photos”, the staff on the train proudly explains… Yes, Myanmar is changing at the speed of light! After passing the viaduct, the majority of tourists got off and the train continued half empty, shaking and rolling even harder. 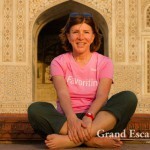 With THE highlight past us, the trip got tedious… Then suddenly, we stopped abruptly! We were not at full speed, by far, but we immediately realized that the breaking was too abrupt to be normal. 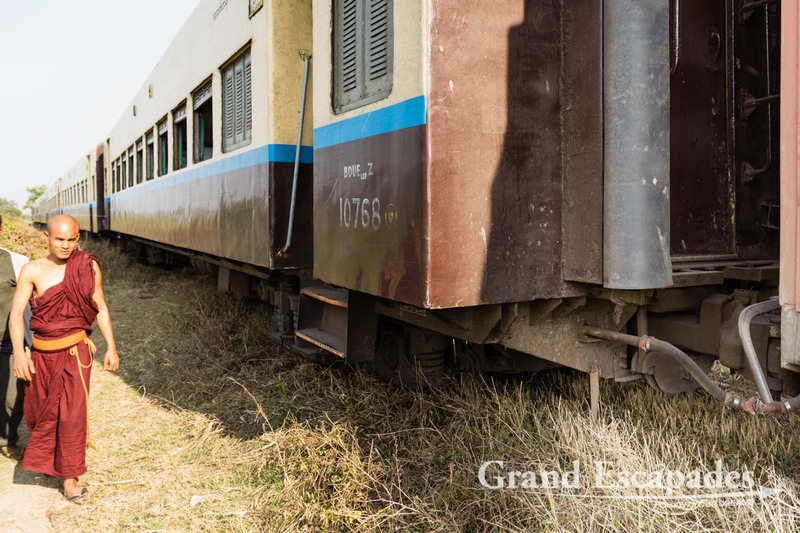 The first to get out were two monks, followed by some local passengers. We are in the middle of nowhere! Soon the few foreign travelers understood what had happened: the last passenger carriage (then comes the one with goats, but that’s another story) had derailed. 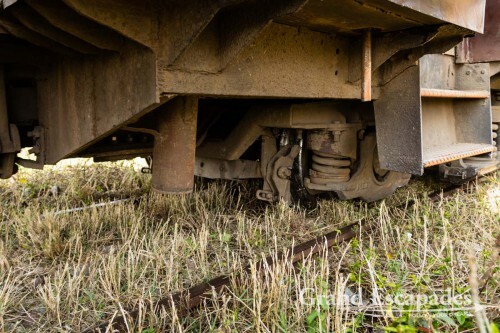 Soon we understood what had happened: the last passenger carriage had derailed! It was high-time for THE question being asked. How many kilometers to Hsipaw? Only 6km? With a small group we headed towards the main road. Two young ladies certainly helped that within minutes several trucks, fully loaded with watermelon, stopped. Each could offer a ride for 2 passengers, in the cabin with the driver. 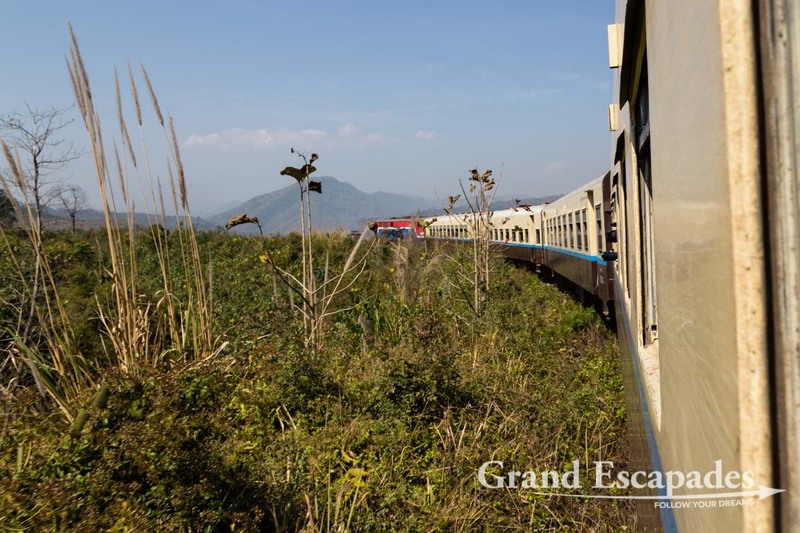 After 30 minutes of our derailing, we were in the center of Hsipaw. 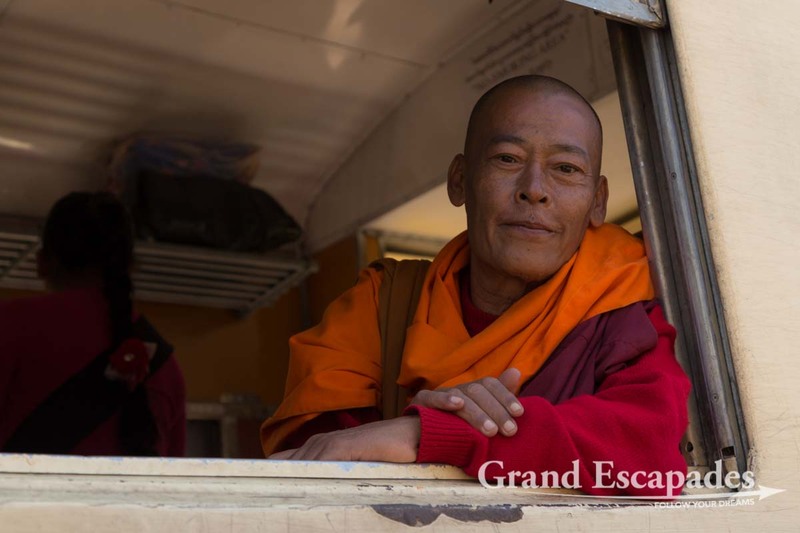 The truck drivers categorically refused any money for the ride. A smile and a repeated “Thank You” was all they wanted… This is also Myanmar!